Keychains and keychain weapons are other essential tools that you should add to your self-defense arsenal. What makes them distinct from the typical keychains is that they have concealed weapons that will help you defend yourself against attackers. With self-defense keychains and keychain weapons, you don’t have to go out and around carrying big, bulky and unwieldy weapons that look definitely and obviously dangerous. You can get self-defense keys and keychains that will go a long way of providing you safety and protection whilst also being easy to carry around. They are also handy and ready to use in case you’re under attack. Plus, these self-defense keychains are easy to conceal which means they pose no danger or threat to you or anyone else. Fortunately, keychains and keychain weapons are not hard to miss, and are not too expensive as well. Manufacturers make sure that their products should be effective as they are affordable as well. One of the most famous self-defense keychains is the Kubotan, a genericized trademark for a self-defense keychain created and developed by Soke Takayuki Kubota during the late 1960s. With the approximate size of a marker pen, the Kubotan typically features six round grooves with a screw eye or swivel, as well as ring attachment for the keys. It is used as a compliance tool, a striking tool, an anchoring or a locking tool, or a fist-loading tool. Even police and law enforcement agents use the Kubotan for many purposes that range from trapping to blocking people. The Kubotan is also applied for martial arts techniques as well. Sometimes it’s not about the best self-defense keychains you can find; it’s also about the best combat tactics that will be the most effective and work best for you. You may even end up getting hurt if you do not use these keychain weapons properly. If you already have the techniques for punching and pouncing your assailant, for instance, and you could use that with a bit of edge through the use of self-defense keychains. Brutus the Bull Dog is one of the most sought-after self-defense keychains throughout the country. You could easily slip your finger into it, and you have the ultimate knuckle-buster weapon which adds a jabbing, clawing and gouging element with every pounce and strike with this keychain’s ear spikes. It is portable and lightweight, thus it is easy to carry. It may be made of ABS plastic, but it is otherwise durable as metal without the additional weight. But the protruding ear spikes is what makes Brutus the Bull Dog somewhat hard to conceal, especially when you wear it. But if not worn, you may think that this self-defense keychain looks cute and innocuous (and it comes in many colors too) – something that you don’t think is capable of harming anyone, at first glance. Most Kubotans are made with aluminum (like this one), which makes it durable even after repeated strikings that make it some fine heavy-hitter. The simple structure of the Kubotan means that it can be applied for many forms of attack: regular punches, hammer blows, or pressure-point attacks against your assailant. Since this Kubotan is blunt and doesn’t have sharp edges, it won’t cut you or make a rip through your bag or clothes. Despite being durable, it will be the most effective only if it’s coupled with the best counter-attack strategies. The Kubotan is small enough to fit in the palm of your hand. You can also keep it in your purse, bag, or pocket, but carrying it can be a bit awkward. Those who are aware of the key pressure points of their attacker’s body will definitely take advantage of the use of this weapon. It has a tapered (but not really pointed) tip, a stabilizing thumb ring and finger grooves for more secured grip to wield non-lethal striking power right from your fist. It is small (about the size of a marker), and is made of 100% solid stainless steel, instead of the typical aluminum construction found on other kubotans. The tapered tip is blunt, but when used with a full power from your fist, you can stab someone really hard. It is also a good tool to use to break car windows or other glass whenever you’re trapped or to avoid accidents. This mere five-inch tube is just like a regular lipstick, but it actually has got a couple of tricks to stun attackers the moment the cap is removed. The Guard Dog Lipstick Gun has a built-in keychain which you can attach to the zipper of your bag or purse. This small stun gun packs a whole wollop – it generates 3 million volts which can easily stun your offender. It also comes with a flashlight which you can use to glare and blind your attacker. Since this comes in a lipstick-like shape and size, the Guard Dog Lipstick Stun Gun’s looks can hardly be called dangerous or intimidating, so it’s a popular self-defense weapon particularly among women and college students. This keychain looks more like a tiny toy ball at first glance, and that’s one of its biggest advantages. But behind the innocuous appearance, the Monkey Fist Keychain actually contains a one-inch steel ball wrapped in good quality paracord that comes in attractive colors. The ball is attached to a cord that allows you to have a greater range or distance as you swing the ball to create a stronger impact on your attacker. However, heavily-bodied attackers may easily brush it off and send the ball instead to the other parts of the body instead of the groin or head. It takes some technique to use the Monkey Fist Keychain; otherwise, if you’re not being careful, it might hit you and you end up getting hurt or injured. 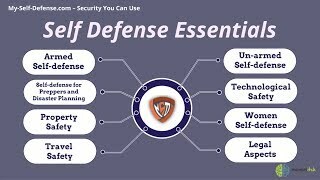 What Are the Top Self-Defense Sprays?